The crane won't come for Henry Moore's "Oval With Two Points" until January. If you thought you were going to miss the Henry Moore exhibition (which was set to close November 2) at the New York Botanical Garden, you have a bit more time. "Moore in America," the largest outdoor exhibition of Moore's large-scale sculpture ever presented, has been extended through January 11, 2009. 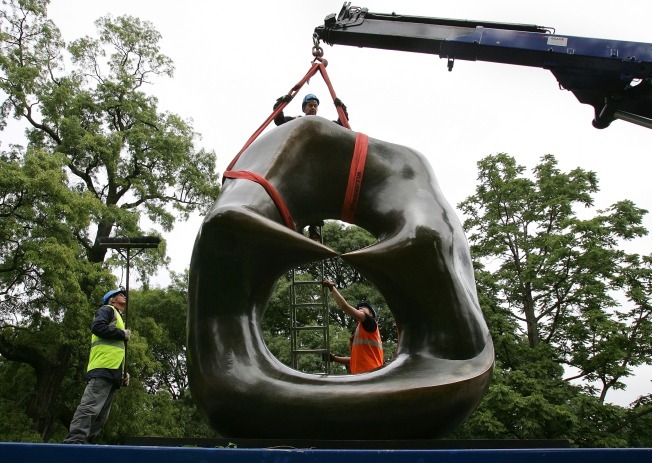 After that all of the sculptures will return to the Henry Moore Foundation in England. So, now's your chance: That Metro North ride is heckuva lot easier than a trans-Atlantic flight. The show collects 20 of Moore's monumental pieces and places them in natural settings throughout The New York Botanical Garden's 250 acres and 50 gardens. Seen in this context, the scope of each work can be taken in and appreciated in ways not normally possible. One of the pieces was so large, reports Nicholas Leshi of the Botanical Garden, that a specially modified flatbed truck lower to the ground was needed to accommodate the city's bridges and tunnels and get the sculpture out to the Bronx. The giant sculptures bear some examination and while some may seem simple at first, they are more than massive lumps of bronze. Case in point: "Oval with Points," an 11-foot-long bronze oval with two points. When a mother asked her child one recent afternoon, "Why do you think its called that?" He might just as easily have responded with, "Well, Mother, this work is obviously a result of Moore's obsessive study of an elephant cranium," as "Because, it is in fact an oval with two points." Maybe he'll have a whole different answer once the grounds and sculptures are blanketed with snow.